Finding Child Care for Infants - Family Times is an award-winning magazine with staff-written news, feature stories and artwork that inform and inspire Central New York parents and their children. Simone Seward, with her son Carter, age 15 months, at Upstate Child Care Center, where all three of her children have gone. The first thing parents should understand when searching for infant child care is the limited number of providers in Central New York compared to the huge demand. Parents are advised to get on a waiting list even before the baby is born. But regardless of the apparent shortage of infant care, every option should be weighed carefully, local experts say. For one, parents must consider the cost. The average price for full-time infant care at a day care facility in Onondaga County is $244 per week, according to Child Care Solutions, Onondaga and Cayuga counties’ child care referral and advocacy agency, with locations in DeWitt and Auburn. The average full-time cost for family-based providers, or those who are licensed to provide child care out of their own home, is $165 per week. Location is another factor in decisions about child care. Parents who have multiple children usually prefer to keep their kids at one place, and they prefer somewhere that is a reasonable distance from their home or workplace. Some providers offer early drop-off times and late pickup times—another point to consider. Intern Rebecca Congel, a student in Syracuse University’s child and family studies program. Determining the quality of care is more difficult than simply weighing cost, location and schedule. To help measure quality, Child Care Solutions and the providers themselves have ample material to help parents choose. New York State Office of Children and Family Services standards for infant day care are already very stringent. The ratio of infants (ages 6 weeks to 18 months) to number of licensed providers at centers is 4 to 1. For a licensed home-based provider, the ratio is 2 to 1. The state also requires at least one provider at a child care center complete pediatric first aid training, although it’s not uncommon for centers to require all providers on staff to complete that training regardless of what age group they care for. There are additional standards for food preparation, health and safety, and play time; licensed providers are required to include outdoor play for babies during the warmer months. White says prospective customers should also ask about staff turnover, and whether there is an open-door policy where they are allowed to visit their child at any time, even if unannounced. Child Care Solutions publishes a free brochure, Parent Guide to Finding High Quality Child Care. In addition to providing information on family care, group family care and child care center costs, regulations, financial aid options and tips for measuring quality, the brochure also explains the requirements for having relatives, friends or neighbors care for young children. While these options are largely exempt from state regulations, the agency does point out that a person who cares for more than two children (who are not relatives) for more than three hours a day should be licensed as a child care provider. Parents are encouraged to research and monitor child care providers using the New York State Office of Children and Family Services’ site at ocfs.ny.gov. That agency, which regulates providers, posts the compliance history of providers on its site. It notes what types of violations occurred but does not provide details on incidents. 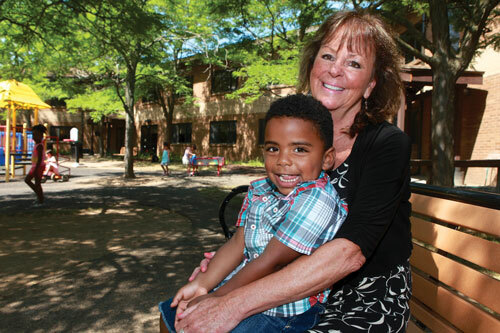 Clare White, executive director of the Upstate Child Care Center, sits with Noah Parker, age 3. Lanno also advises parents to show up to the child care provider’s facility or home unannounced from time to time to monitor consistency. Lanno recommends checking out as many providers as possible and narrowing it down to a final three, if possible. Parents should proceed with their research and decision-making process even if they are on a waiting list for a center. But Lanno cautions against setting unrealistic expectations. Child Care Solutions employees emphasize that while they make referrals for different child care providers, they do not make recommendations. It’s really up to the parents to ask the right questions and decide for themselves, says Patrice Robinson, the agency’s marketing director. Clare White, the Upstate Child Care Center executive director, added that parents or expecting parents need to immediately get over any timidity about asking tough questions. Staff at her facility and many others are happy to introduce all of their employees to prospective parents, but the parents should go beyond that and see what they can find out from other parents who were in the same situation. “You should never underestimate the effectiveness of word of mouth,” White says. 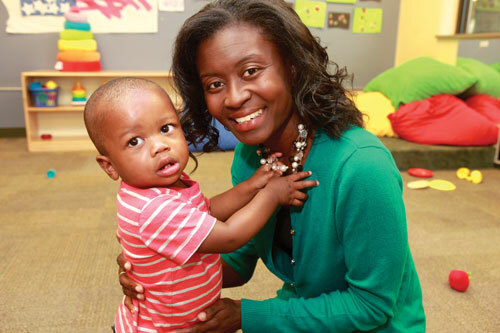 Simone Seward, of East Syracuse, visited 14 infant care providers, both family care and centers, before she enrolled her kids at Upstate Child Care. She began her search about four months before her first child, Tristan (now 6), was born. All three of her final choices had waiting lists. Seward says she was looking for a place that was “clean, bright and homey.” She wanted the rooms to be organized, so the person in charge of a child had a clear line of sight to the youngsters at all times. She also paid close attention to how the caregivers interacted with the children and other parents. For Seward, it was important to see if a provider was quick to walk away from a conversation with a parent in order to tend to a child’s need.